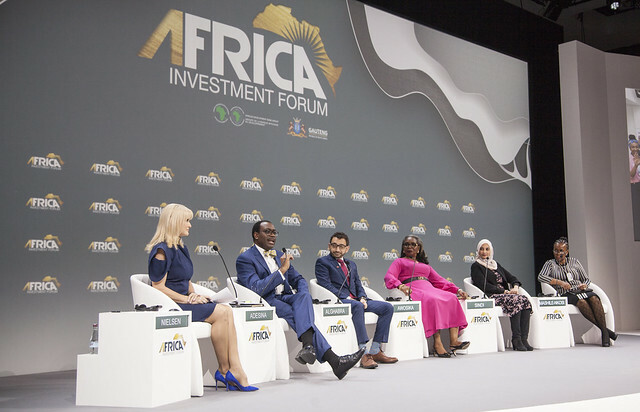 Panelists on the first day of the inaugural Africa Investment Forum have urged investors to ensure that women are placed at the heart of financial systems, echoing President Akinwumi Adesina’s call for increased support to women. Adesina made the comments while addressing a session on “Investing in Women for Accelerated Growth,” as the Forum got underway in Johannesburg, South Africa. Adesina, joined a panel of prominent and successful women including Ibukun Awosika, President of First Bank of Nigeria Limited, Hayat Sindi, Senior Advisor to the President of the Islamic Development Bank and Daphne Mashile-Nkosi, Executive Chairman of Kalagadi Manganese attended the session. Omar Alghabra Parliamentarian Secretary to the Minister of foreign Affairs of Canada, was also present. He called for solutions such as the Affirmative Finance Action for Women in Africa (AFAWA) “to change the financial system to be able to lend more to women and “de-risk lending to women businesses through guarantee facilities,” he added. Panelists called for increased investment in women-led businesses to strengthen their contribution to the economic development of their communities and help lift the continent out of poverty. “We need to make women a critical component of our financial system,” said Awosika. Women entrepreneurs experience significant funding gap of US$42 billion annually, the panel revealed. However, women are more likely to reimburse loans compared to their male counterparts. Women are still confronted with banking systems that are reluctant to lend to them to start or develop a business. Constraints that deny African women entrepreneurs’ access to financing include the perceived risk of investing in women led-businesses and gender-related discrimination. Sharing her experience, Mashile-Nkosi, recalled the time when she was looking for funding to develop her mining business. Despite being deemed worthy of financial support, some banks demanded she quit her position as group CEO before receiving any funding. “Men see risk when they look at women,” she added. The discussions ended on a positive note with an overview of solutions to empower women for greater financial autonomy. Some of the solutions discussed included, FirstGem, an offering by First Bank designed to provide enabling opportunities for women to achieve their financial goals and aspirations; the African Development Bank’s Affirmative Finance Action for Women in Africa (AFAWA) aimed at unlocking women entrepreneurship through strategic partnership. The Asian Development Bank Transform Fund, which provides seed money for start-ups and SMEs to develop their ideas and facilitate commercialization of technology among the institution’s member countries. Empowering women through education and knowledge was also mentioned as a way to support women entrepreneurs. The panel session was part of the Africa Investment Forum knowledge events. The Forum, an initiative of the African Development Bank is an innovative investment marketplace dedicated to developing projects to bankable stages, raising capital, and accelerating financial closure of deals.